Stranger Things Comic Coming from Dark Horse | Nerd Much? Apparently Telltale Games isn’t the only team getting to take Netflix’s Stranger Things franchise out for a spin. Dark Horse Comics has announced a Stranger Things comic is coming from the company which fleshes out more of the story during the time of Season 1. EW had the scoop on the story and published a short preview as well as some of the comic line’s upcoming covers. 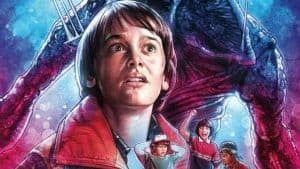 Dark Horse’s story looks to primarily focus on the events of Season 1 through the perspective of Noah Schnapp’s Will Byers. Byers was stalked by a horrific creature at the conclusion of the show’s first episode. The boy mysteriously vanished, with the show eventually explaining that Will was taken to an alternate dimension that the kids dubbed the Upside Down. Although Will’s presence could be felt by his mother Joyce (Winona Ryder), the character wasn’t seen for much of the show’s initial season. The Stranger Things comic from Dark Horse will return to the events of Season 1 and tell the tale from Will’s point of view. Will’s story will be fleshed out over the course of a four issue miniseries. The comics will be written by Jody Houser with illustrations handled by Stefano Martino. Keith Champagne will do the ink, coloring will be done by Lauren Affe, and lettering by Nate Piekos. This won’t be a one off series for Dark Horse though. The company told EW that their partnership with Netflix consists of a “multi-year publishing line” that will offer the comic brand “an opportunity to explore the mysterious world of Hawkins, Indiana.” Each season of the show takes place roughly a year after the events of the prior season. So there should be plenty of time in which to mine some new stories. Season 3 of Stranger Things is likely to begin streaming in October. The third season will take place in the midst of 1985 with Back to the Future being the coolest thing on the planet.